EveryDad Bryan Cranston gives voice to parental frustration in the sequel to "Go The F**k to Sleep." 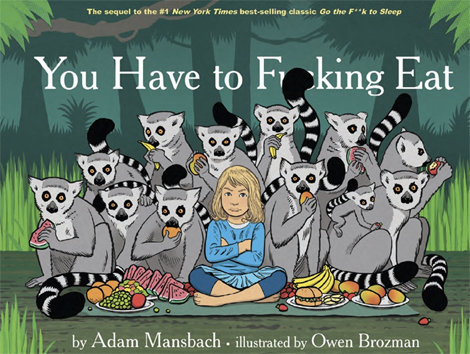 Adam Mansbach’s 2011 kids-book-for-adults, “Go the F**k to Sleep,” became a viral hit, topped the New York Times and Amazon bestseller lists, might become a movie, and booked none other than the venerable Samuel L. Jackson to narrate the audiobook version. Those are big shoes for the sequel to fill, but “You Have to F**king Eat” dropped today along with this teaser of Bryan Cranston narrating it—and we are sold. (Even if we weren’t, it’s available as a free download for the next month). It’s a masterstroke of casting, combining the hapless suburban dad-ness of Cranston’s Malcolm in the Middle character with the menacing darkness of his Breaking Bad role. It’s also very possibly a career highlight for Cranston, putting him in the company of other Mansbach performers like Morgan Freeman and LeVar Burton. You can listen to a different 30-second clip on the Audible.com page, if you needed any more convincing that a free download of Bryan Cranston doing anything is worth clicking on.